App for accessing your location data. Verizon's iPhone Sales Help Make Apple the Third-Largest Mobile Phone Brand in the U.S. Prove Your IPhone Is Faster Than Android, Win $1,000! I will go over the entire PR on the next episode along with many of the other stories and any items not covered by the PR. All iPod's Sold = 9 Mil - but said over 50% were iPod Touches. Est = 5 Mil iPod Touches sold last quarter. iTunes Store = >$1.4 Bil Revenue for the Quarter. 186 Carriers around the world for iPhone. 90 Countries have the iPhone at the end of last quarter. 88% of Fortune 500 companies have deployed or are testing iPhone. iPad is now in 59 Countries. Can you blame iPhone for killing Flip? Technology News: Handheld Devices: So, Is Apple Cheating? Update: Make sure to read the comments at the end of trouble shoot help. This is for Jailbreaking - NOT for unlocking. If you want to take your iPhone to another carrier (unlock) then this is not the tutorial for you. Note: This tutorial works for iOS 4.3.1 for the iPhone 4 (GSM), iPhone 3GS, iPad1, iPod Touch 4th Gen, iPod Touch 3rd Gen. If your iOS devices is not listed it is not supported with this tutorial. Do not try to jailbreak if you don't like when things go to (expletive). If you need your device for your business and being without it for any period of time will cause you to loose your job - stop now. If you get mad at your significant other at how they fold towels or put the toilet paper on a roll - Jailbreaking is probably not for your personality. Sometimes things break and your device will likely crash more often then if it was not jailbroken. Apple "claims" jailbreak voids your warranty if that is an issue stop now. Squaretrade still covers jailbreaking. Step 0 - Before you start make sure you update your iOS device to iOS 4.3.1 if you have not done so already. If you do not know how to update your iOS device jailbreaking may not be for you. 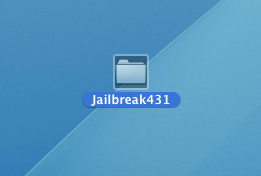 Step 2 - Create a folder called "jailbreak431" on your desktop. 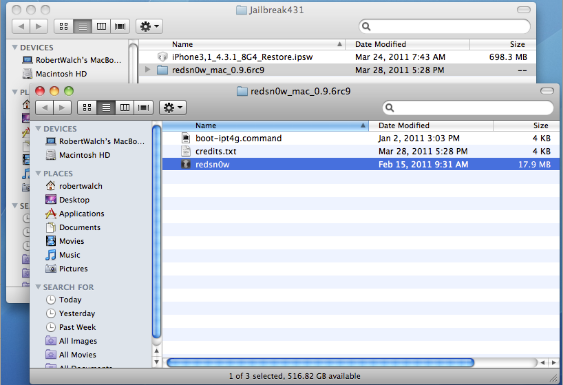 Step 4 - Extract from the zip file (by double clicking) and drag the folder into Jailbreak431 Folder on your desk top. 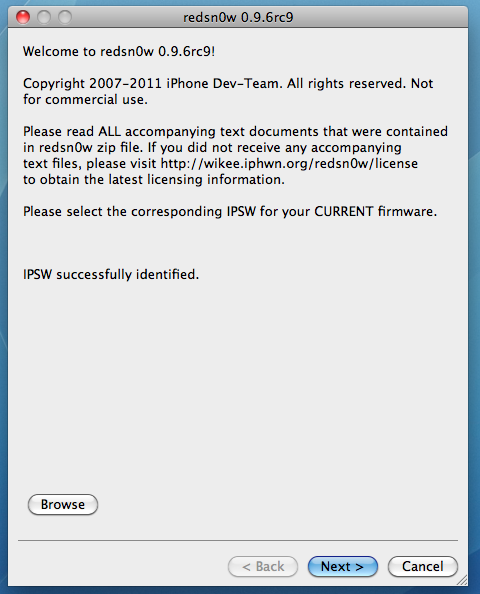 Step 6 - Move IPSW file into your Jailbreak431 folder. 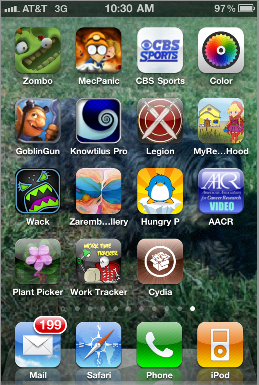 Step 7 - Open the Jailbreak431 folder and then the Redsn0w folder and launch the Redsn0w App. 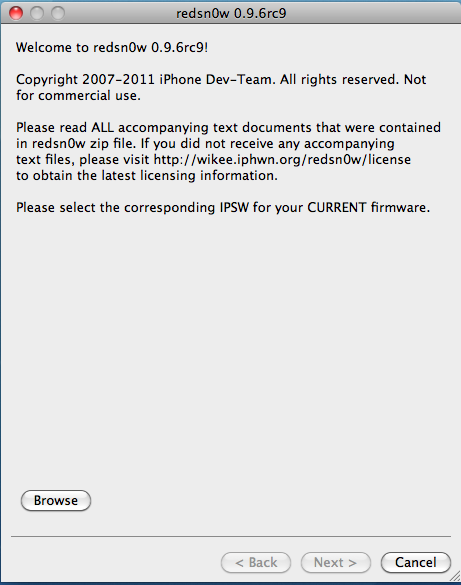 Step 8 - Click the browse button and find the Jailbreak431 folder and choose the IPSW file (Firmware). Step 10 - You will then be taken to a screen on the Redsn0w app that asks you to "select your options" - Instal Cydia will already be selected. For most users that is all you want selected - then click "Next"
Step 11 - You need to make sure your iOS Device is both turned off and connected to your computer. 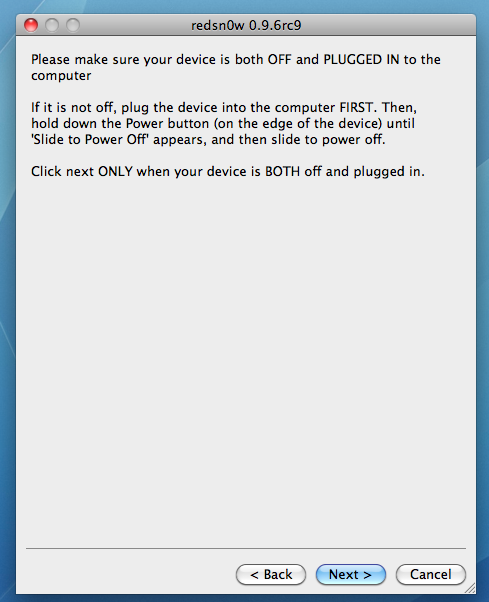 Do not connect via a USB hub or Keyboard or monitor port - Connect directly from the Computer USB port to the iOS device. Note: If you connect your turned off iOS device to the computer at this stage - it will likely turn on your iOS device. If so after it boots up - hold down the power button and slide to turn it off again. 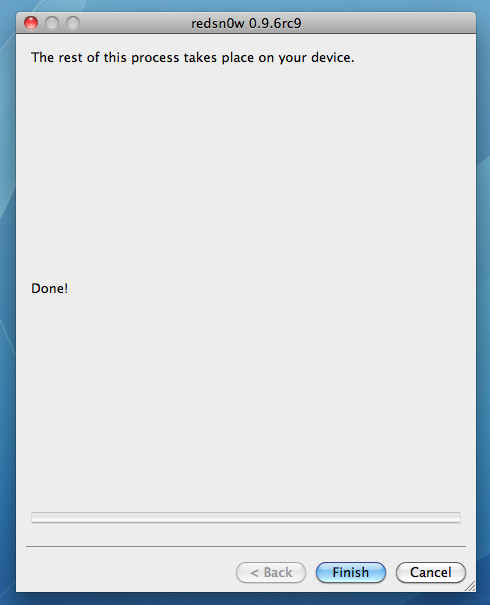 Once you confirm you are connected directly to your computer and the iOS device is turned off - you can click "Next" - Note this next step will take some good timing and following of directions. 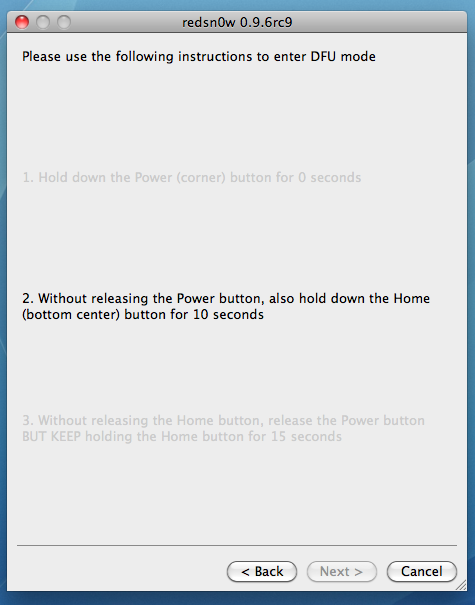 Step 14 - Then you will release just the power button while continuing to hold down the home button for 15 seconds. 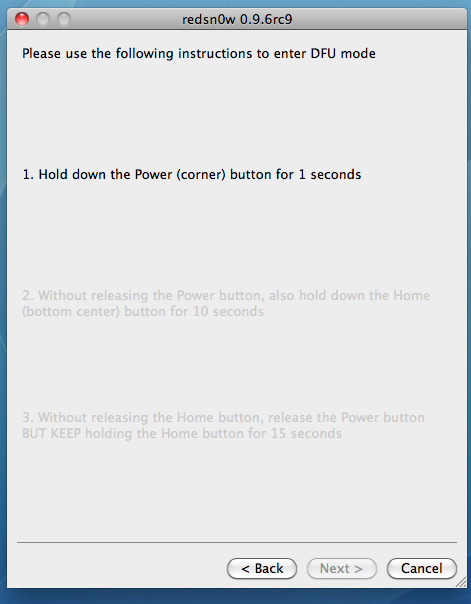 If you / when you mess this step up by releasing the wrong button(s) you can click the back button and try again. 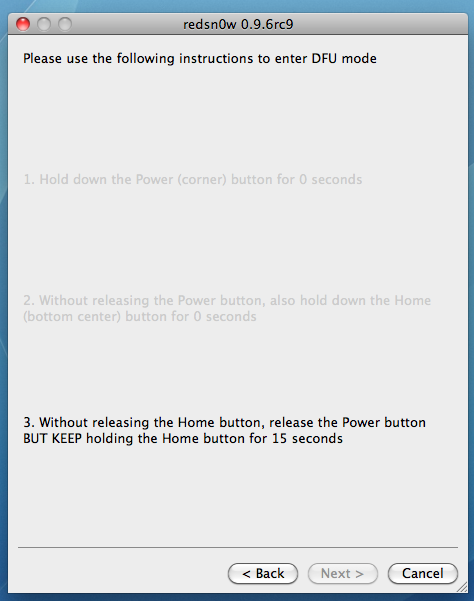 Step 15 - You will see a message saying Waiting for reboot. Then one that says "done" Do NOT click on Finish yet. On your iOS device you will see a bunch of activity including some code - Do not remove the iOS device from the computer. After a minute or so you will see a Pineapple with legs and a message Moving Applications. At this point just be patient the jailbreak process is finishing up. 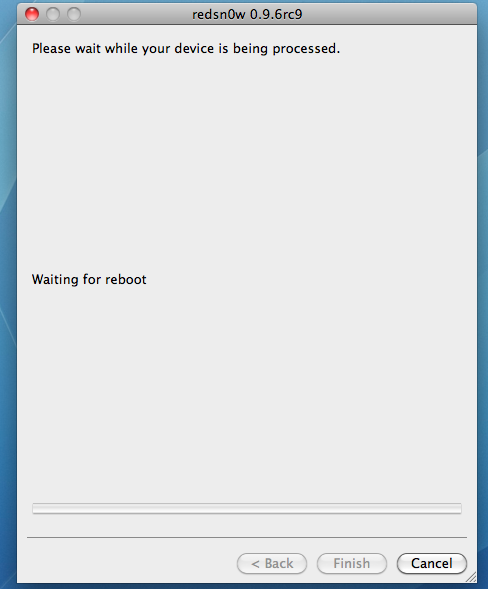 It will take a few minutes for the process to finish and for your iOS device to reboot. If it has been more than 10 or 15 minutes and the iOS device screen is all black - tap the home button one time - chances are it finished and you missed it. If it shows the slide to unlock screen you can then click "Finish" in the Redsn0w App. That is it - you are jailbroken. Step 16 - You can now find the Cydia App on your iOS device. It is a brown icon and labeled as "Cydia". Note some reports say right after the jailbreak - the Cydia App is showing up as all white - but after a reboot of the iOS device it returns to its normal brown icon. Step 17 - Tap on the Cydia App to launch it. The program will do some maintenance the first time you open it. Step 18 - Once it is done it will open up and you should see a screen that look like that below. One App almost everyone will want and that works on the iPhone's, iPod Touch's and the iPad is the app Backgrounder. This app allows true multitasking on your device and it is free. To install this app Tap on "Search" in the bottom row of Cydia and then in the search box type "backgrounder"
Next Tap on "Backgrounder from BigBoss" the second one - not the one that says "(2.x only)"
At this point you have installed your first jailbroken App. It is recommended you open up Backgrounder and adjust some of the settings. First tap on "Global". After you make your donation that is. Set all the switches to "ON". Then go Tap "Back" and then Tap "Control"
Finally scroll through and select how you want to be able to enable and disable backgrounding for apps. Personally I like the "Short Hold" of the Sleep Button. It makes it very easy to enable and is not likely going to be enabled by accident. Please understand sometimes installs of apps are interrupted - in which case you need to try and re-install. Things are not as stable when you jailbreak - expect some additional crashes and conflicts between apps.